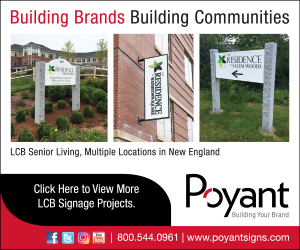 New Bedford, MA – Poyant, a sign manufacturer and branding specialist serving local, regional, and national organizations, has appointed Kym Nutting to business development, handling both national and regional accounts. In her new role, Nutting is responsible for building and maintaining strong relationships with architects, commercial contractors, and independent business owners throughout the New England area as well as major national retailers, corporate accounts, and franchisors/franchisees throughout the country. Nutting has more than 15 years of experience in consultative solution-based sales, account management, and business development. She has a strong background in advertising, marketing, publishing, branding, and industrial sales. Prior to joining Poyant, Nutting owned several businesses, including a publishing company, automotive franchise, and a home renovation and interior design business. Nutting understands the importance of building and maintaining recognizable brands, meeting time-sensitive deadlines and budget requirements, as well as the need for professionalism, practical solutions and proactive communication. “We are happy to welcome Kym to Poyant. It is exciting to add another highly experienced, detail-oriented, service-driven member to our team. Her clients truly appreciate the passion, sincerity and hospitality she dedicates to building every relationship,” said Richard Poyant, President of Poyant.